Feeling stressed? Little or no energy? Constantly craving sweets? Can’t lose that last 5-10 pounds? Imagine yourself clear-headed, vibrant, fit, and healthy! Eighty percent of your success in being healthy is related to NUTRITION. Even if you exercise, your diet needs to come from a variety of wholesome and healthy foods to see lasting results. Patty Torza, Certified Holistic Nutritionist, will assist you in making the healthy changes you need to reach your goals. She has a non-dogmatic approach to nutrition that is highly individualized and results-oriented. Brochures and more info available at the Front Desk. 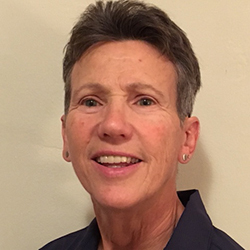 Patty Torza has been in the Fitness Profession since 1973 as an athlete, teacher, administrator, coach, trainer, and lecturer. She has been a Nutrition Consultant since 2002 and was Board Certified in Holistic Nutrition from 2008-2017. Patty counsels individuals and designs customized nutritional plans that support her client’s goals as well as their unique and individual needs. She also frequently lectures on nutrition to small and large groups. Patty believes that health is an essential human right, and that each one of us needs to pay attention to our own health & wellness and seek out health care practitioners who are willing to be our partners in health.